Today I will talk about the costume of a river valley in the south of Carinthia, Koroška [Slovene], Kärnten [German]. 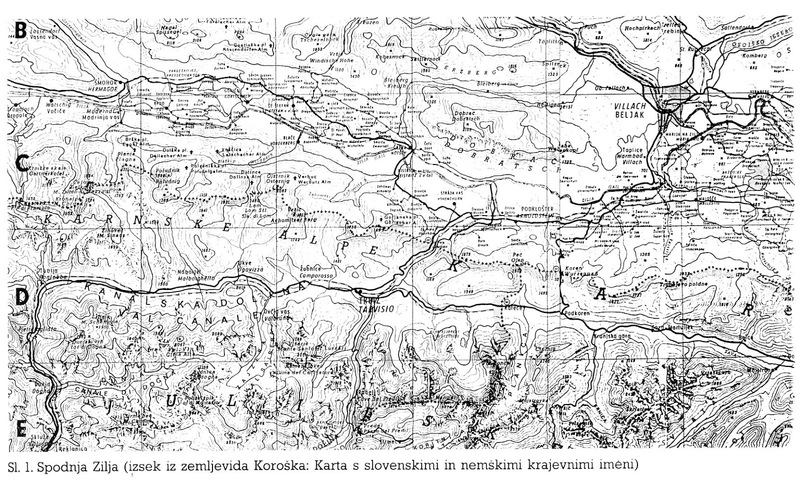 Most of this province is in Southern Austria, east of Tyrolia, but a portion is now in Slovenia. 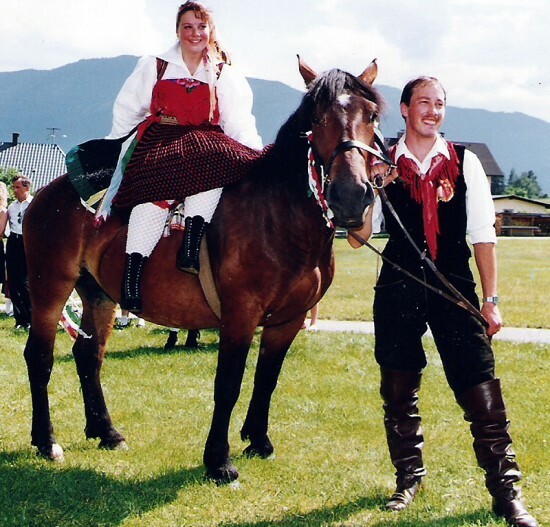 This costume is found in the lower part of the valley of the river which in Slovene is called Zilja, and in German is called the Gail, which is found in the southwest of Carinthia, between the towns of Šmohor [Hermagor] and Beljak [Villach].This region was inhabited by Slavs at least since the 9th cent, but Germanization has been going on for many centuries now. 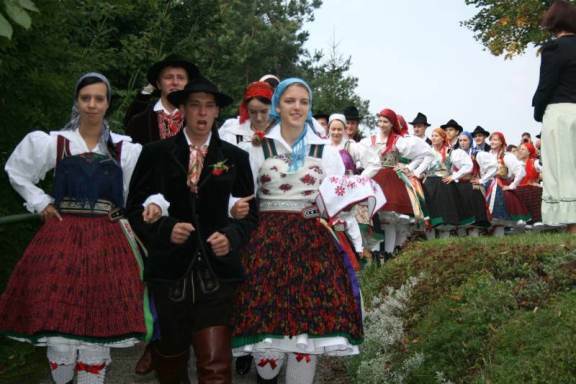 The upper valley, west of Šmohor [Hermagor], has been German-speaking since the 15th cent. In the lower valley however, there is still a significant Slovenian-speaking minority, and most of the German speakers are Slovenes which have lost their language. Those who identify themselves as Slovene see this costume as an important part of their cultural identity. Those who speak German also wear this costume, seeing it as part of the heritage of their area. 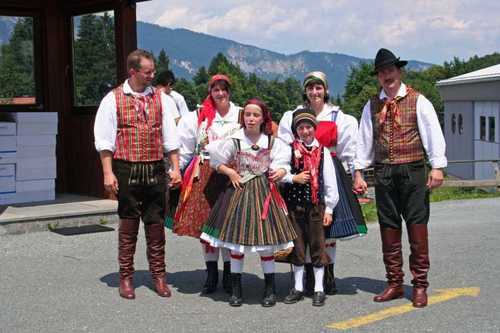 This region is entirely within the present borders of Austria, although barely; the mountain ridge on the south side of the valley forms the border of Austria with Italy and Slovenia. 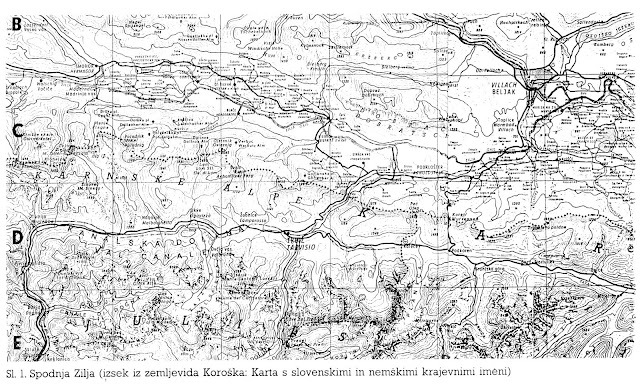 Here is a map of the area which gives place names in both languages. 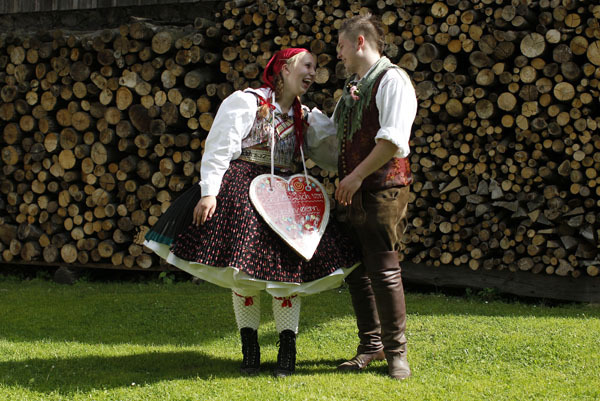 The festive costume is now only brought out for special occasions, but it is still worn regularly. 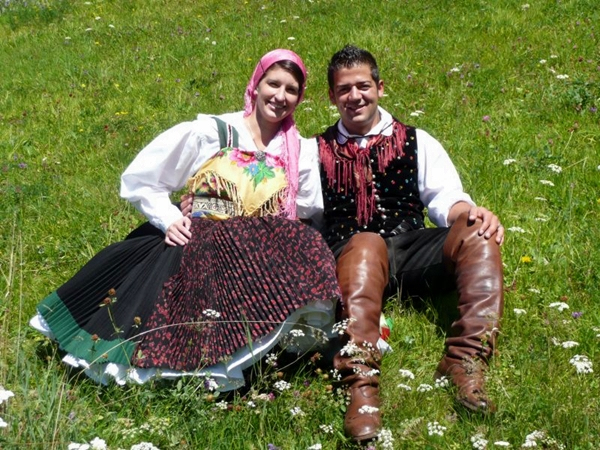 This costume is very attractive and distinctive, resembling no other costume in either Slovenia or Austria. The foundation garment is a sleeveless or short sleeved chemise, cut very simply in the Western European tradition. Here are two examples of the cut. Stockings knitted with a strong texture are put on and secured with garters. 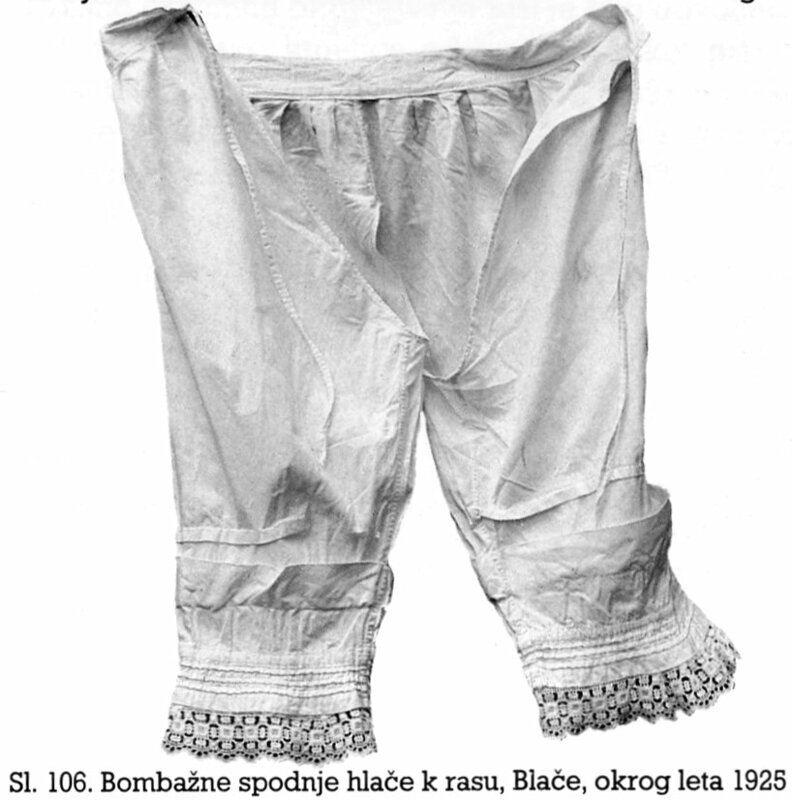 Bloomers are worn, another west European influence. 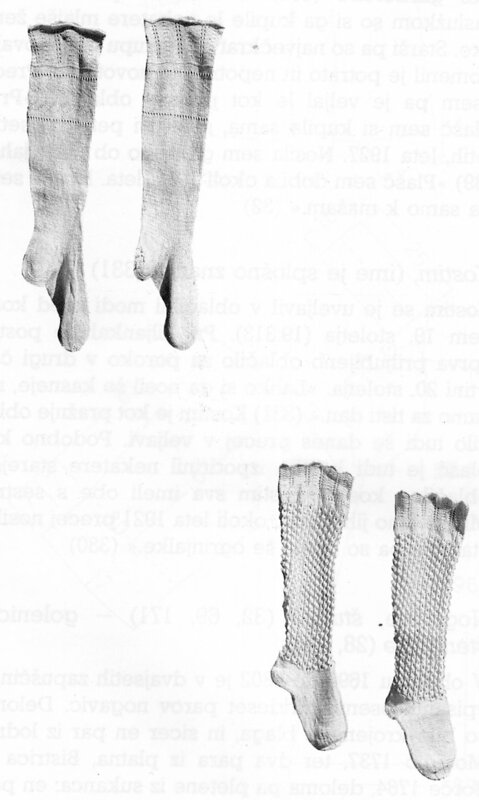 The stockings extend up past the leg openings of the bloomers, which help to hold them in place. 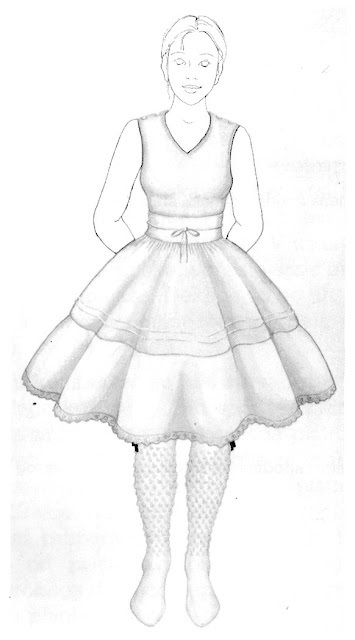 A narrow petticoat is worn over the chemise. A second or third one which are slightly fuller may be added. If a girl's hips need more emphasis, a very short, very full petticoat may be worn which adds fullness to the hips. 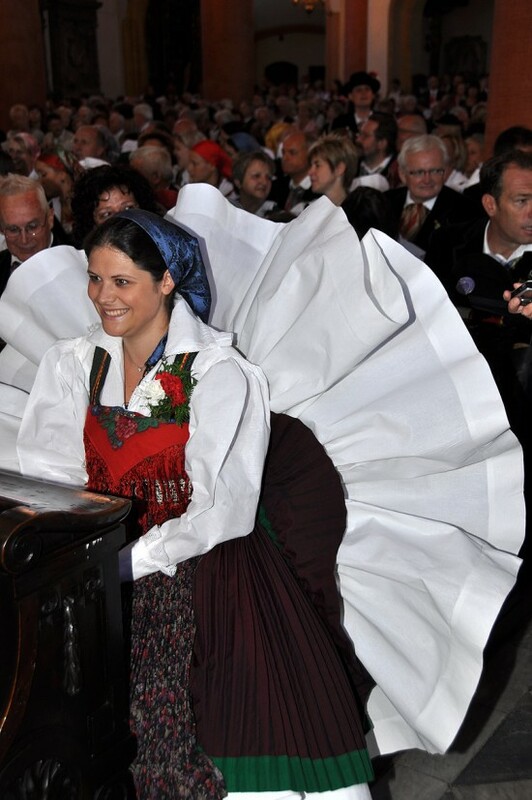 Over this is worn the 'krilo' or wings, which is a very full petticoat, made of thick linen or cotton, and starched so that it stands out from the body in waves. It may be fastened to a waistband, or it may have its own bodice. 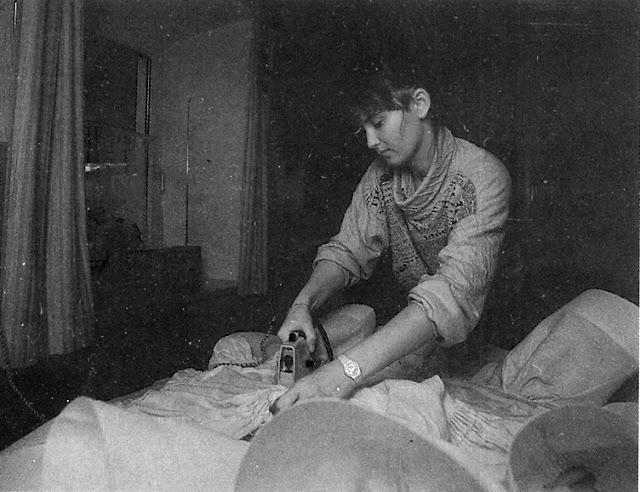 Here is a woman ironing one of these, you can get a sense of its dimensions. Now comes the blouse. It has sleeves which are very full at the top, smock-gathered into the shoulder, and which taper towards the wrist. 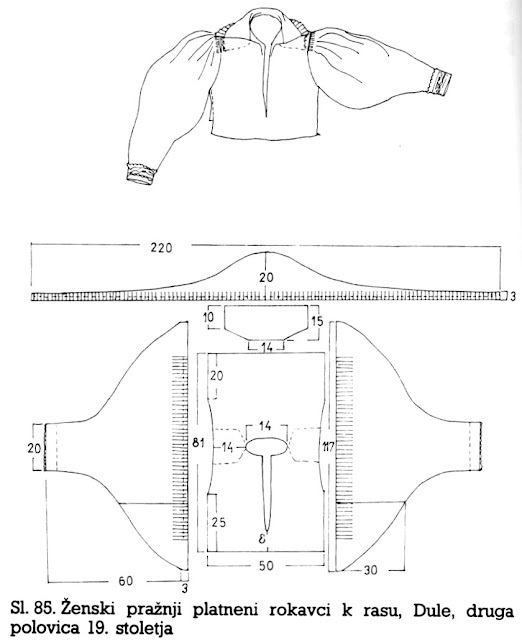 There is no cuff, but a portion of the sleeve may be turned back. This is finished with whitework embroidery. 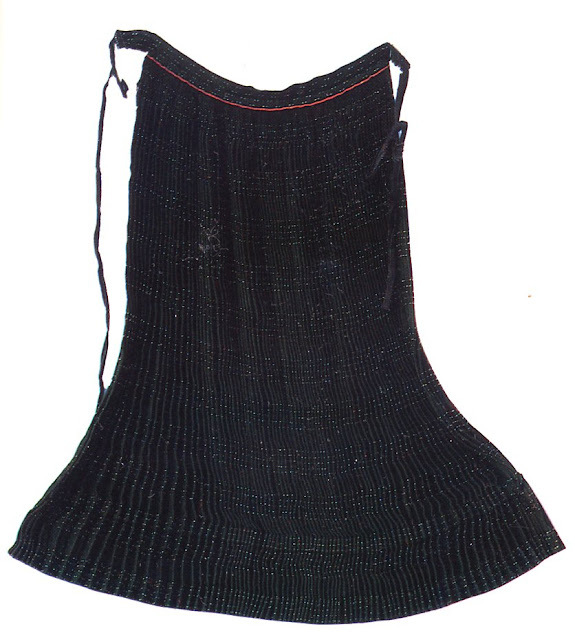 There is a wide fold down collar which has a pleated flounce attached to the back edge. This is short at the edges and long in the center. 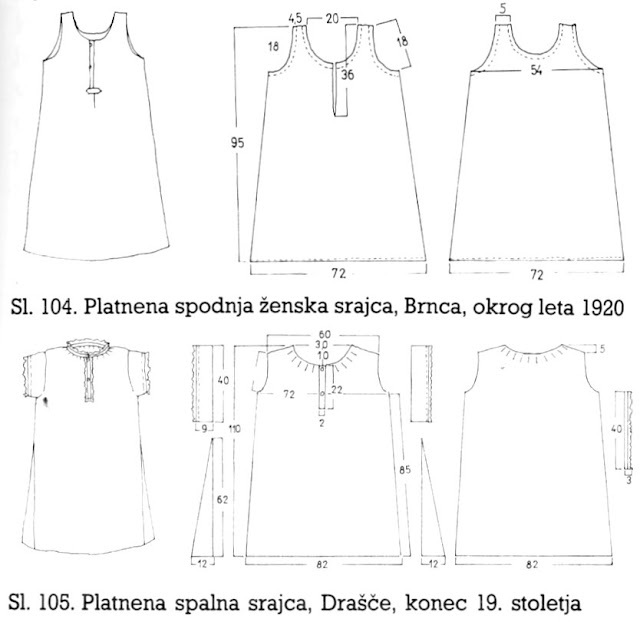 The sleeve ends, the body just above the sleeves, and the collar may be ornamented with whitework and possibly lace. Now we can put on the outer garments. The skirt and bodice are sewn together, the skirt being very full and pleated all around except possibly for a panel in front. It is made of a single solid color, black, navy, blue, chestnut, etc. usually with a green strip sewn onto the hem. Sometimes it is closed in front with buttons, other times it is left open. 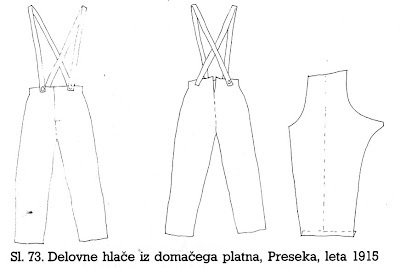 The bodice may be open to the waist or have a panel connecting the front pieces. 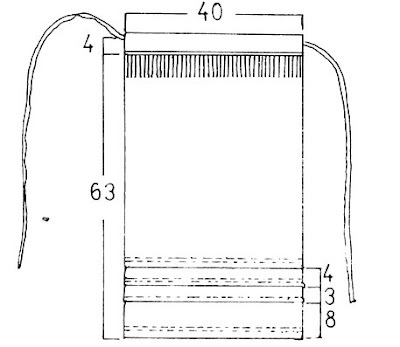 This diagram shows one skirt panel. 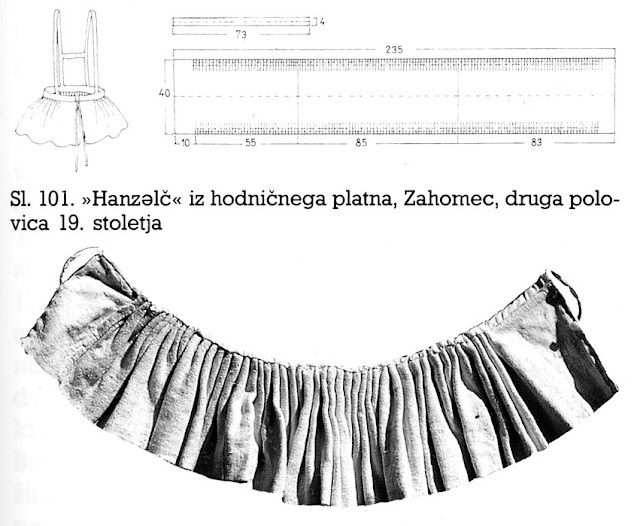 In general, 7 such panels are used to make the skirt. 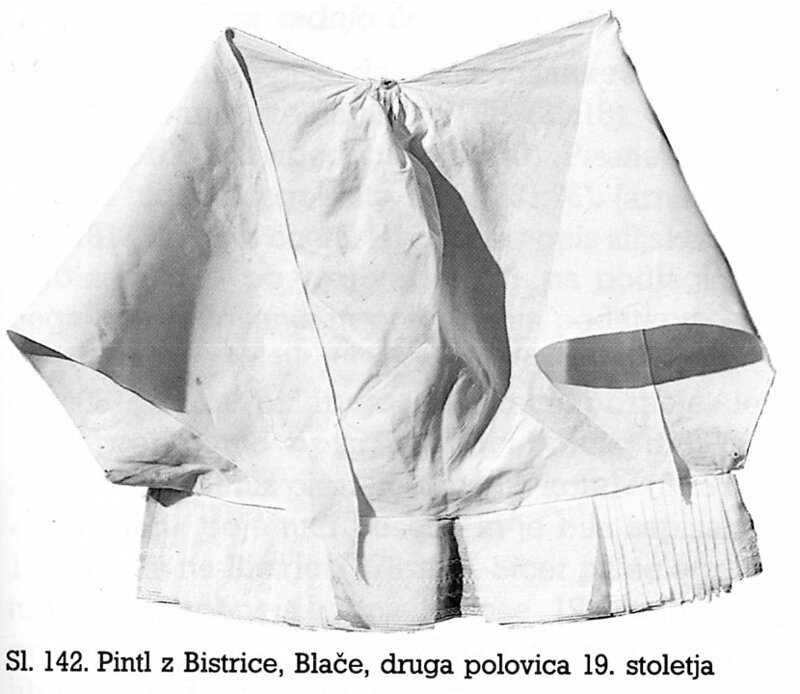 The winter costume, which is now seldom worn, has a petticoat sewn in the same way as this outer skirt. 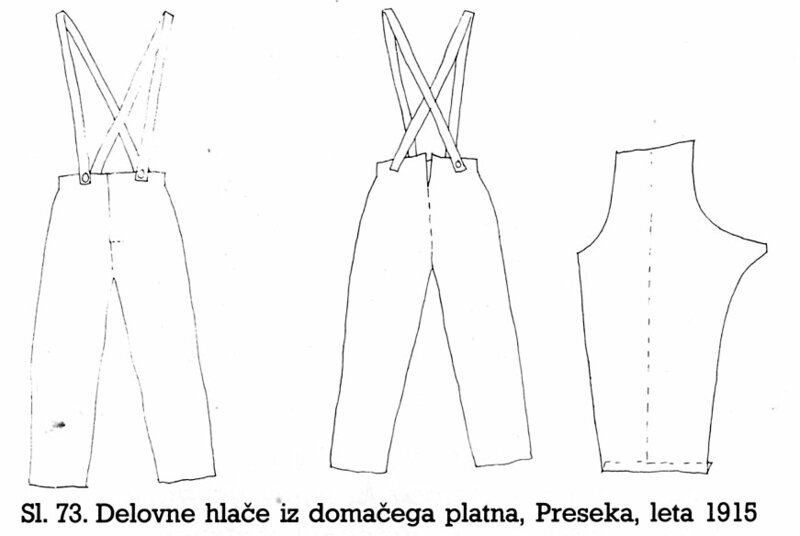 Each pleat is sewn in by hand, in a technique similar to smocking, and a waistband is sewn over the finished product. 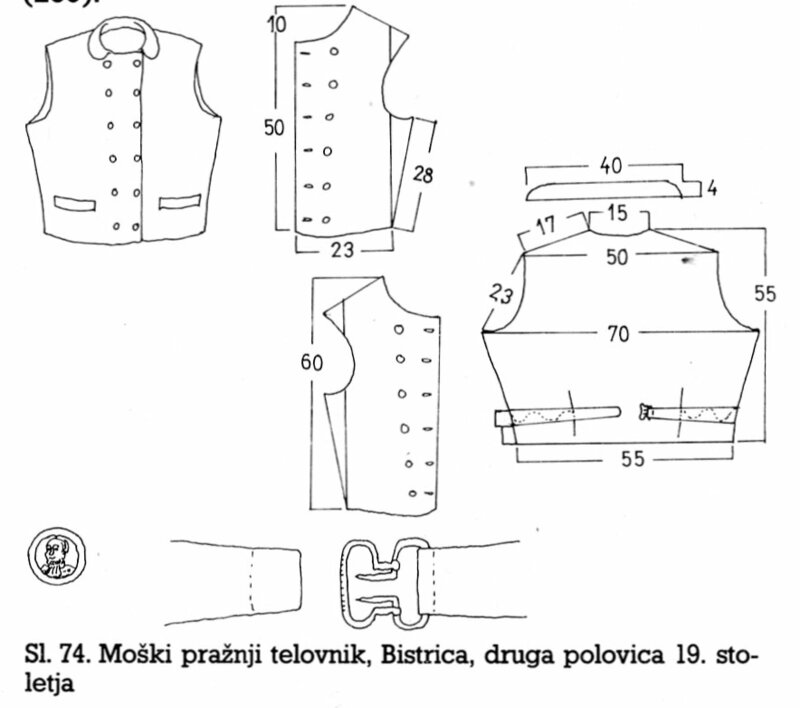 The bodice is sewn of a patterned material, often the same as that used for the men's vests. Generally a solid dark color with a scattered floral pattern, or it may include stripes. The armholes and neck/front opening are bound with a wide band of material, often topstitched, with a secondary edging of rickrack or narrow ribbon, sometimes with small 'prairie points or other ornamentation. Here are some examples. 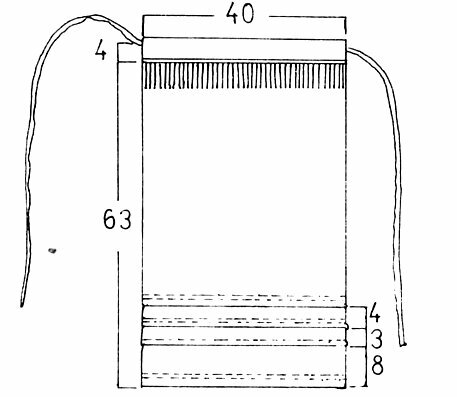 The apron is sewn in a similar manner, using only one panel. 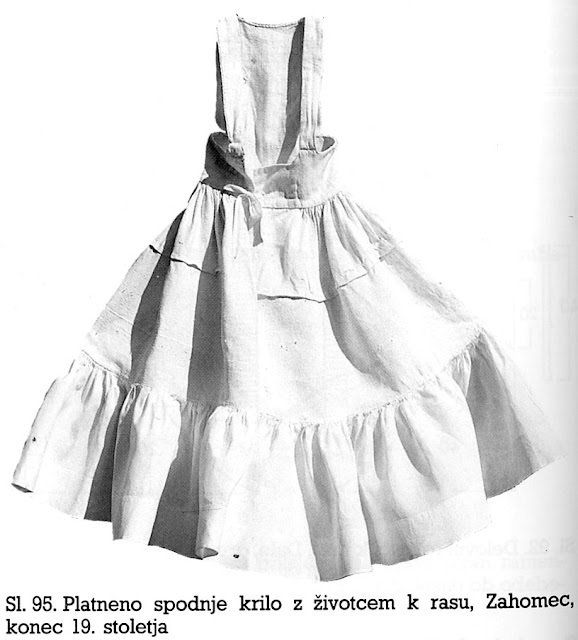 The apron is usually of a printed cloth, in a wide variety of colors and patterns. It may have tucks. Since such an outfit is expected to last many years, the opportunity was taken to show off fine sewing skills. 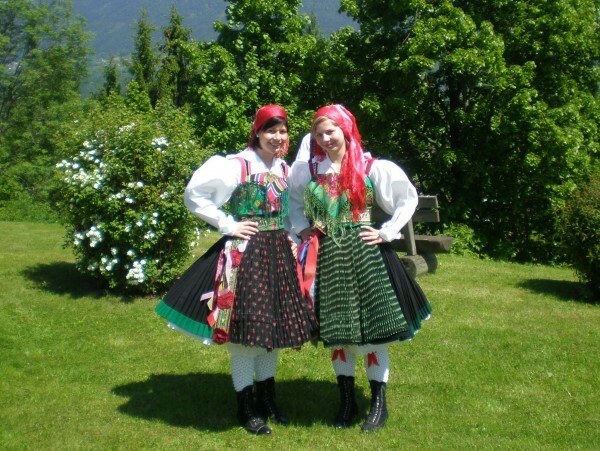 This is typical for folk costumes. A silk kerchief is folded diagonally and pinned across the chest with a brooch, the ends wrapping around the waist and hanging behind. The kerchief is the same as those worn in Gorenjsko, with fringe. Often a corner is left hanging in front from where it is pinned. A leather belt is worn with this outfit. 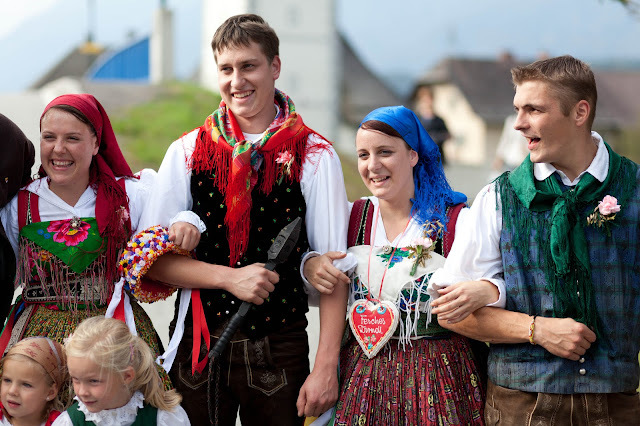 It is embellished with the quill and thread embroidery so common in Tyrol, Gorenjsko and other nearby regions. 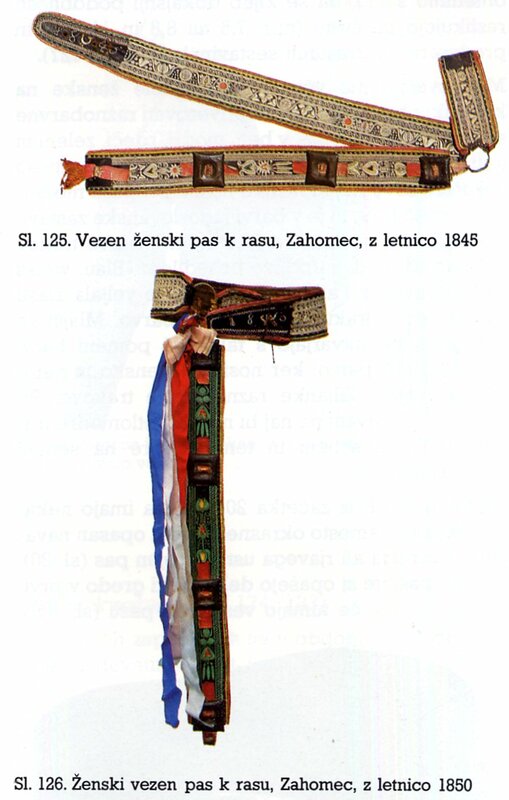 It is unusual to see such a belt worn by women, however. It is made in three parts, joined by a ring. 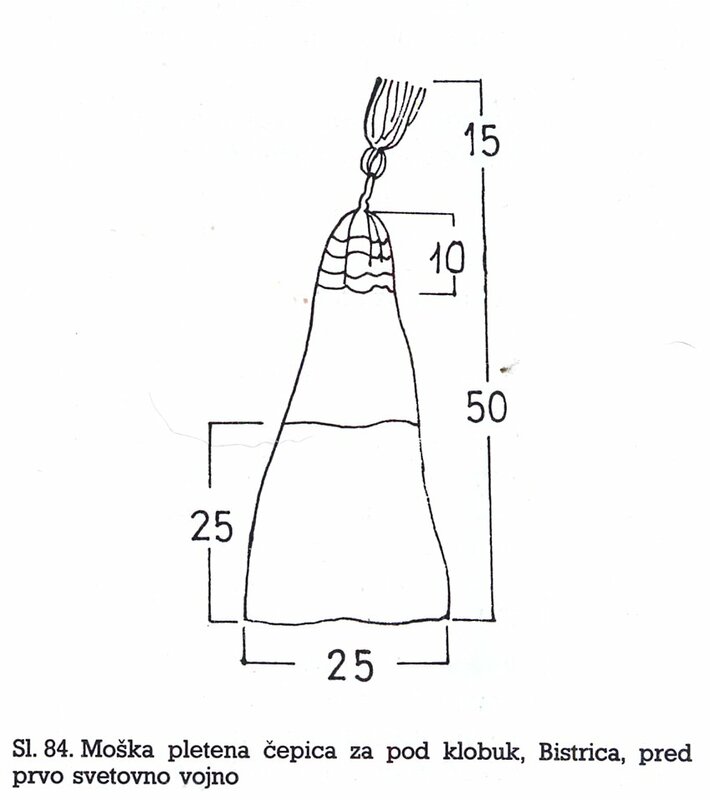 The ring is worn at the hip, one part wraps around the waist from behind, the second, shorter part hooks behind the first in front, and the third hangs from the waist, this hanging part may be long or short. A clump of ribbons generally is also attached at the ring to hang down the hip as well. In keeping with west European tradition, the year of manufacture is often embroidered onto the belt. Low lace-up boots are worn. These are often highly ornamented. Low shoes may be worn as well. 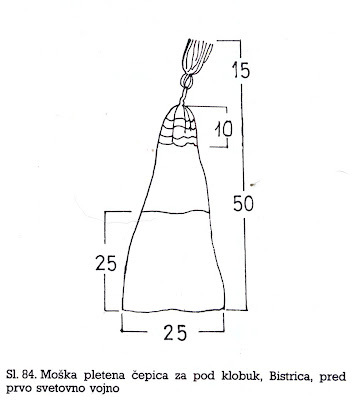 Most commonly today, a simple kerchief is tied around the head, but in the past another headdress was worn, quite similar to the zavijačka worn in Gorenjsko. This is called the pintl. 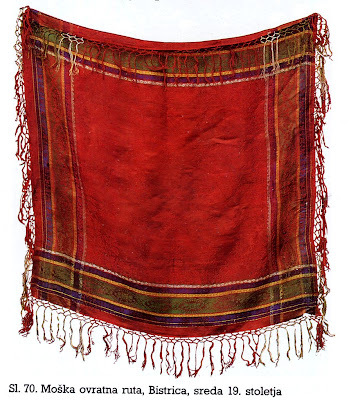 The basic form is the same, but instead of an embroidered velvet band being sewn on top of the head, an embroidered white linen flounce is sewn onto the front, being pleated many times so that it frames the face. 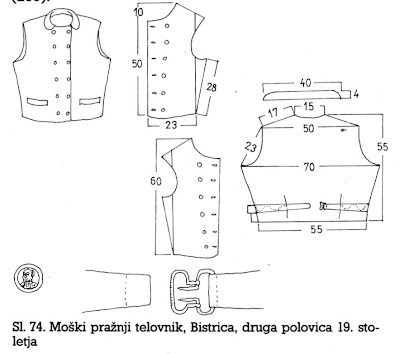 Here is the structure, and some examples of the embroidery. Here is a photo of one. If you look closely, you can see the whitework on the flounce. The pleats to either side may be over or under the central flat portion. 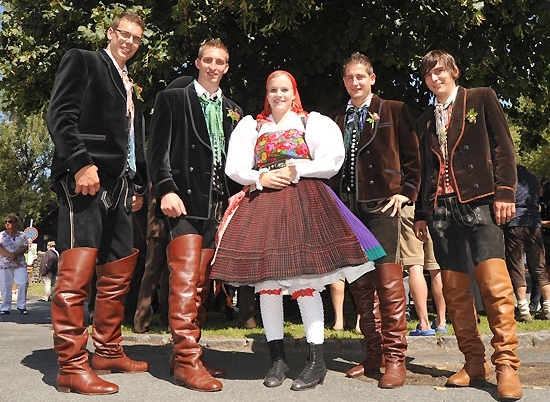 The men's costume is not significantly different from that of Gorenjsko or other parts of Carinthia. 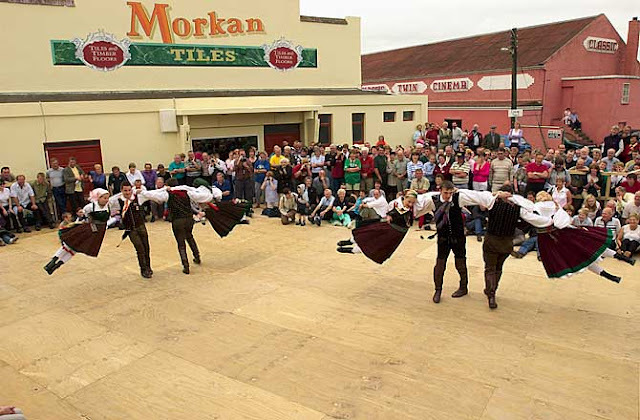 A vest is worn, usually sewn of a dark cloth with a scattered spot design, but sometimes of a silk plaid. It is closed with many silver buttons. 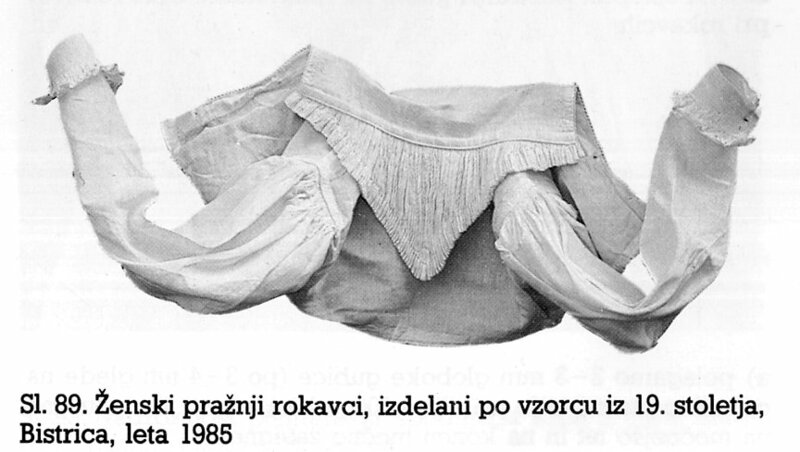 It is often single-breasted as in Gorenjsko, but may be double-breasted. 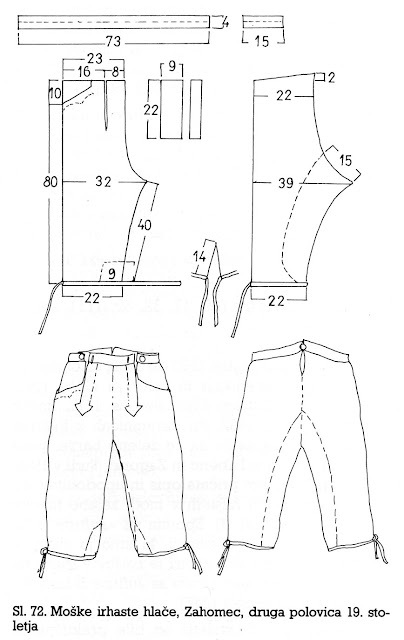 It extends to the waist and is cut straight across the bottom edge, with no points. 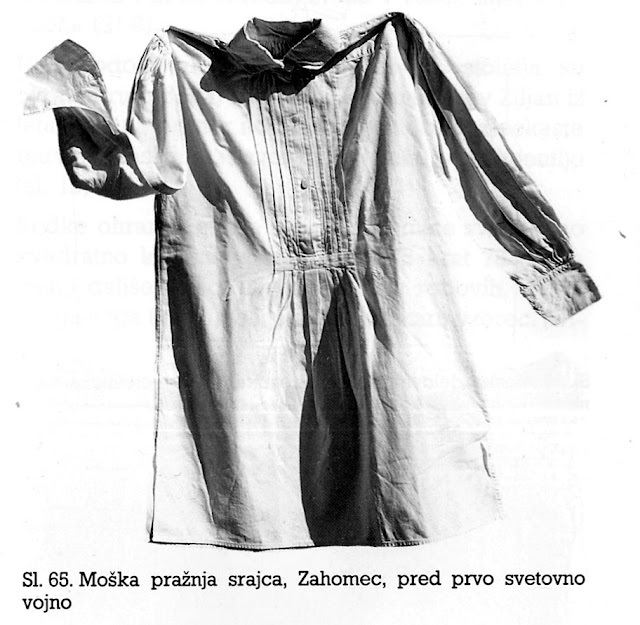 Long linen pants are worn, as in Gorenjsko. For everyday work these are worn alone. For dress and festive occasions, leather knickers are worn over these. These are often embroidered, as in Gorenjsko and other parts of Austria. 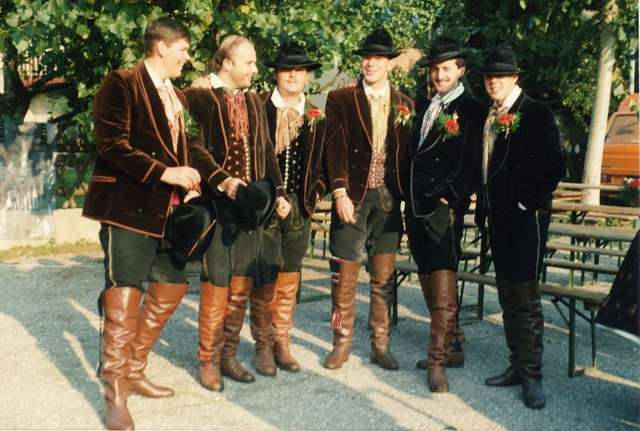 When these are worn with the high boots, the linen underpants are not visible. 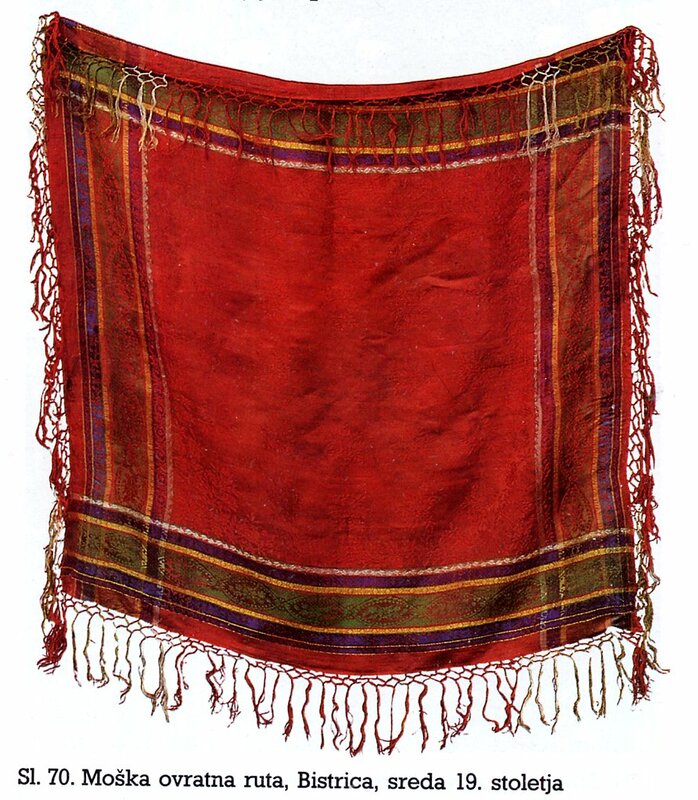 A colorful silk scarf is tied around the neck. Most commonly, high boots are worn, which come above the knee. 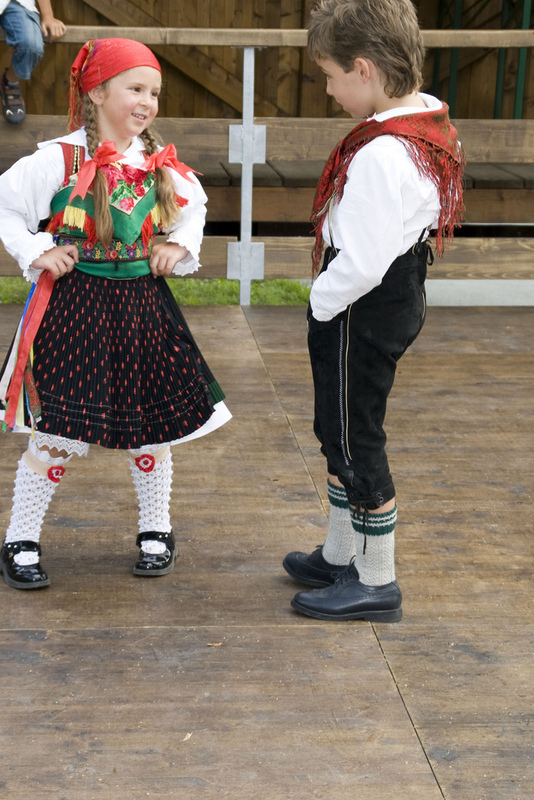 Otherwise, shoes and knee socks may be worn, as in other parts of Austria. Traditionally, a knit stocking cap is worn, and a felt hat over that. Today, each may be worn alone, as in the above photo, or none. 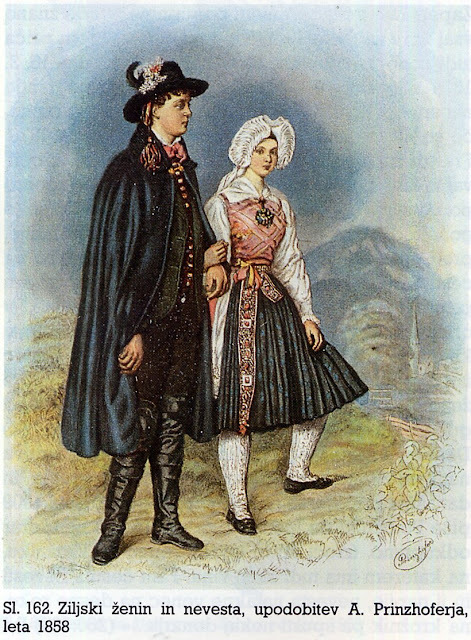 For full dress, a jacket is worn with this outfit. It greatly resembles the modern day suit jacket, with fold down collar and lapels. These were mostly made by professional tailors. Slideshow of a festival in this region. 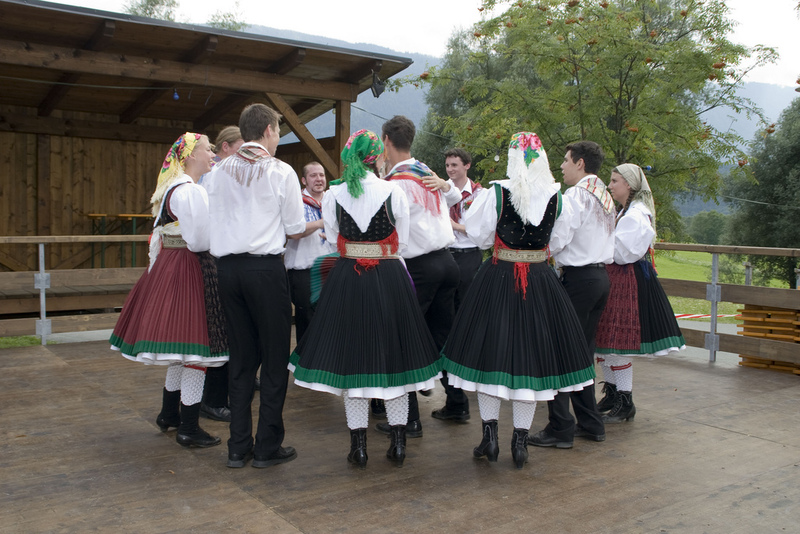 A group performing a medley of dances and songs from Ziljska Dolina. A group of Gailtal men singing in Slovene. 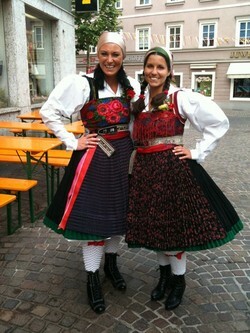 they are wearing plain black pants with the traditional outfit. 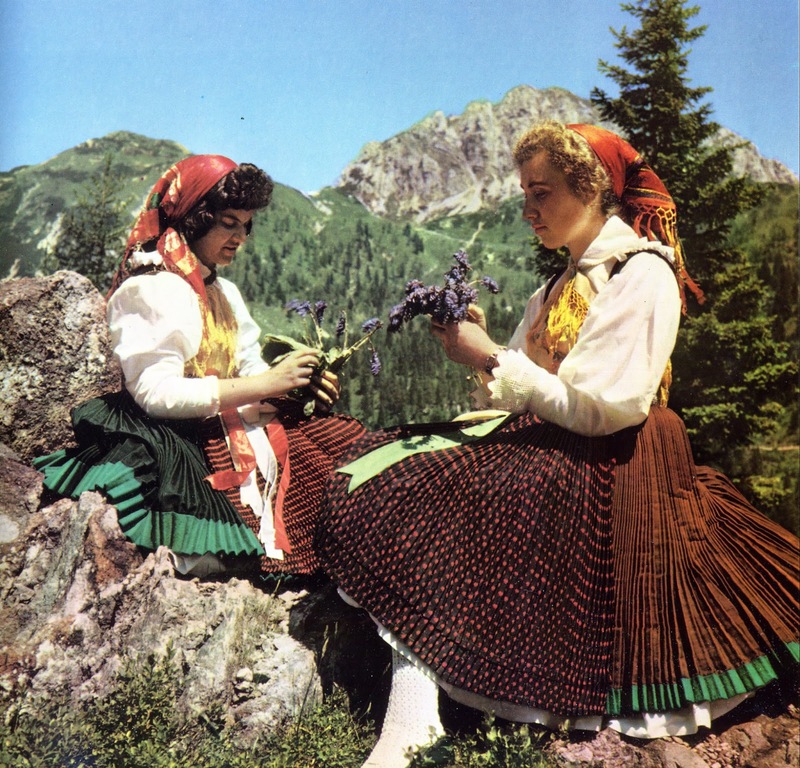 There are many facebook pages devoted to Folk Costume these days. They are becoming a valuable resource. Thank you again! This is always so interesting. I found this new (?) 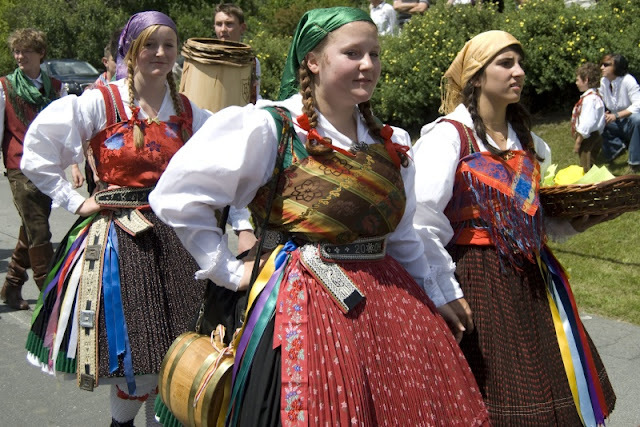 estonian folkclothes portal. It is all in estonian, but has a lot of good pictures. Thank you for this long and interesting article.I'm just wondering what the kind of round and embroidered hat(?) is that a girl has in her hand (the pic after the silk scarf...). I'm seeing it nowhere else.... Thanks once again to share your knowledge. 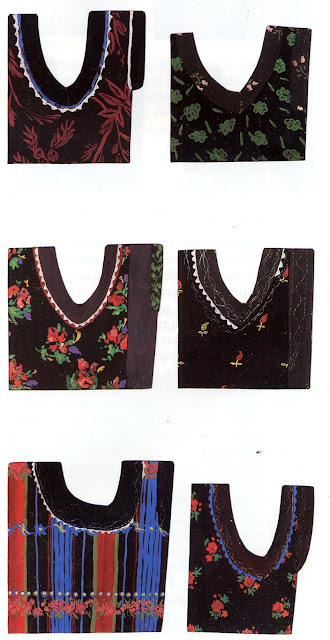 it seems to be covered with artificial flowers rather than embroidery. It does seem to be a trophy, but I do not believe that it is a race, rather you will notice that three of the young men in the photos are holding short spears, and are tilting at what looks like a bucket on a post. I am not sure what the object of the contest is, however. 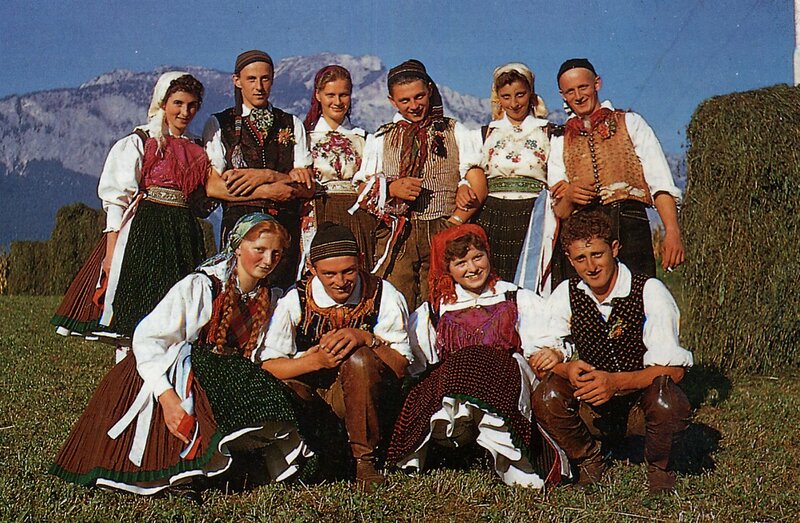 Some excellent pictures of 'Koroška-Ziljska' costumes of the Slovenians living in Carinthia, Austria. 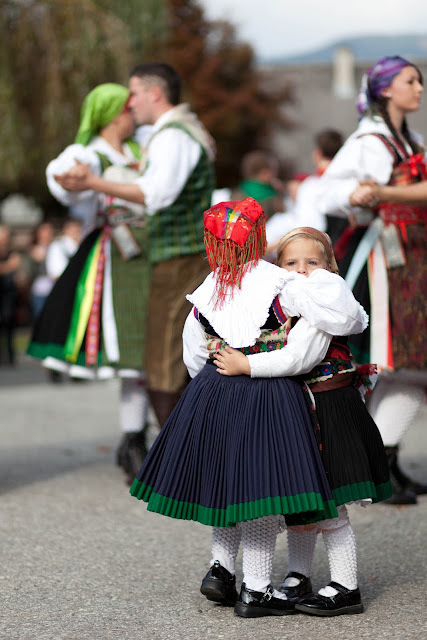 Hopefully you will not mind if I forward some to a site that I putting together focusing on costuming from different regions of Slovenija? 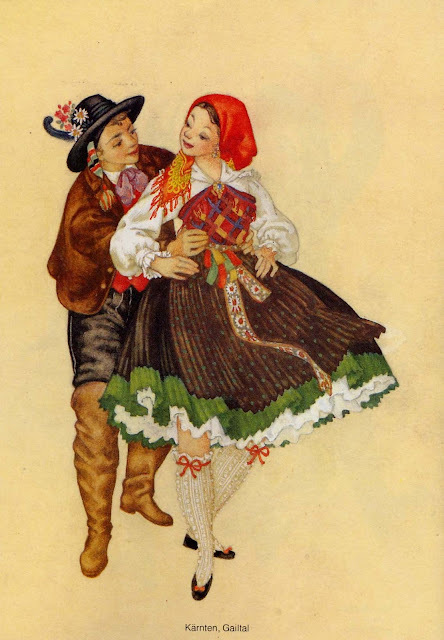 This Ziljska costume is still found in the Zilja valley, but also is used by the folk dance group in Celovec-Klagenfurt as their own, even though another costume exists around that city/area. 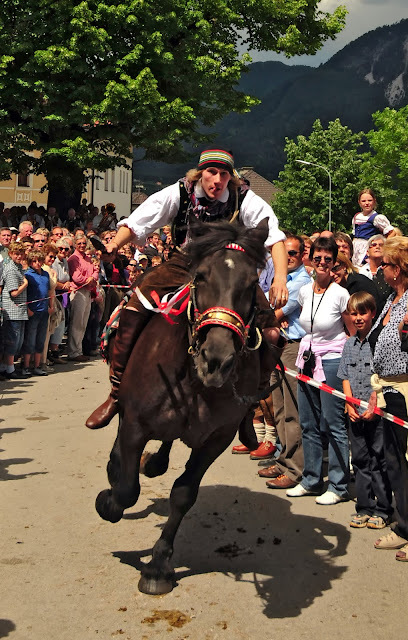 The pictures that you all discuss about the competition are during a specific feast day of particular villages. 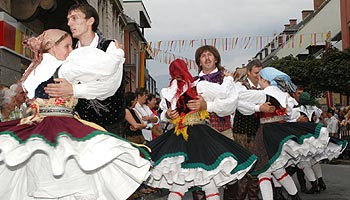 This whole event is called 'štehvanje' and includes young men & women dressed in traditional clothing. 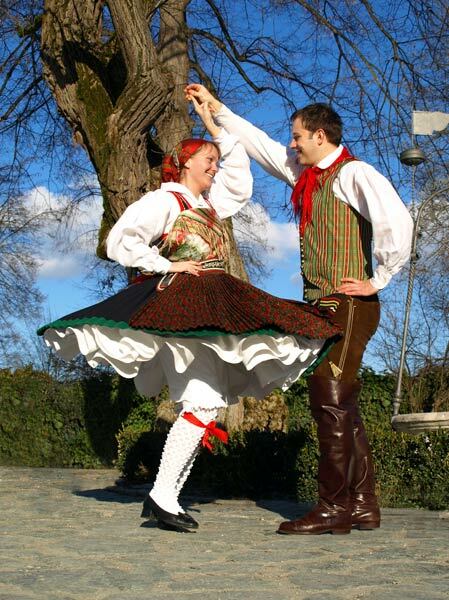 Following this competition there is a dance under the linden tree for only selected people, namely those that competed and their chosen partners. 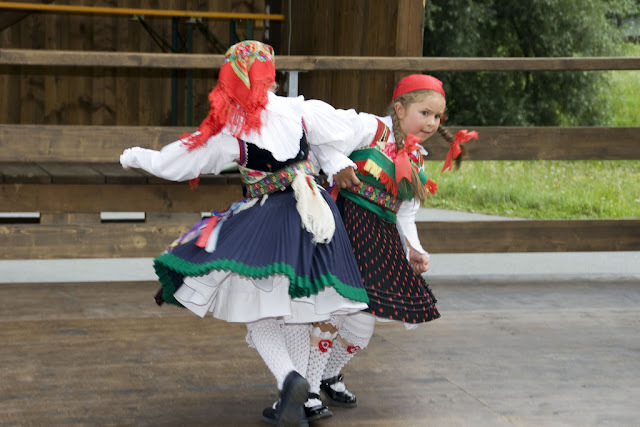 A dance called `prvi rej`, translated to `the first dance`is danced and sung. 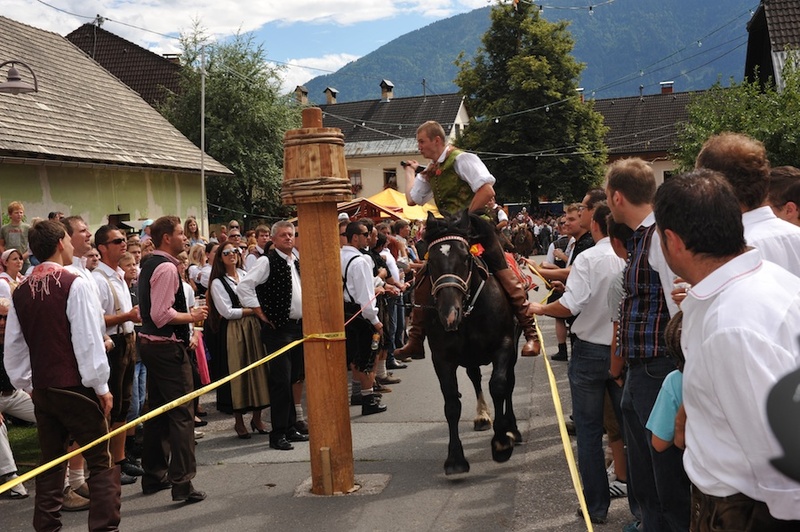 During 'štehvanje' young men on horseback would gallop towards a barrel and proceed to hit it while in full gallop. They want to impress the ladies by showing their dexterity, showmanship and strength. The ultimate objective is to hit the barrel and break it apart. Each man on horseback would follow each another until ultimately the barrel would break. The men would continue having turns until it broke. 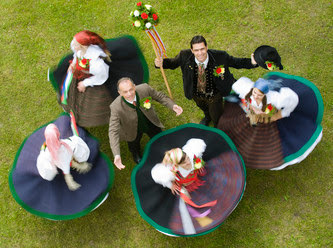 The 'pušelc', the wreath of flowers, was given to one of these competitors. It was not always given to the victor, the man who broke the barrel, but instead, to the man that the girls chose as being the best in the competition. This man would lead the first dance later under the linden tree. Hope this helps? You may use whichever of the images you think would be useful. Roman, always welcome to 'take' any information from our site. 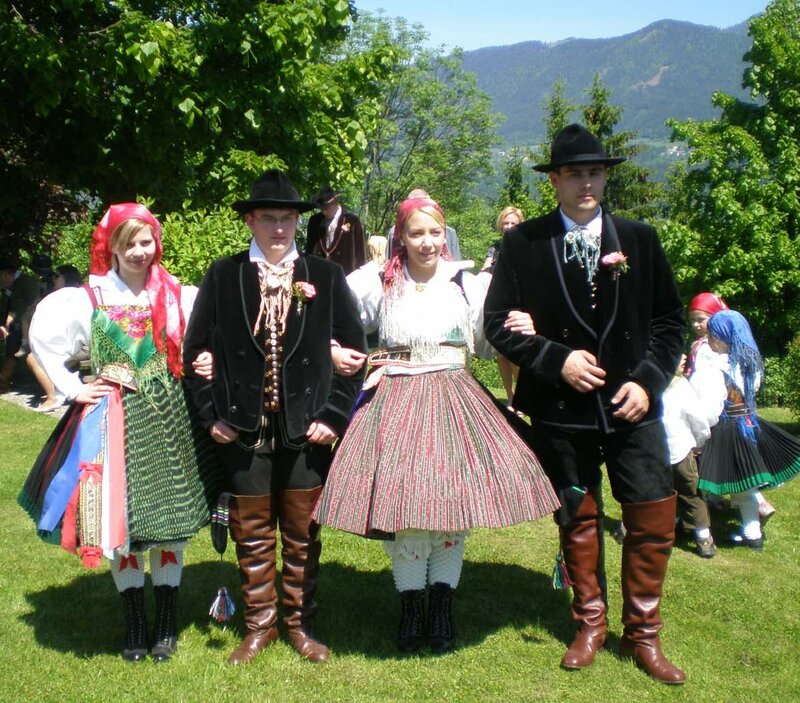 You will find it on Facebook, search for "Slovenska ljudska noša - Slovenian traditional costumes" and 'like' it for further updates. Please help spread the word. Thank you for this incredibly detailed post, it's very educational. 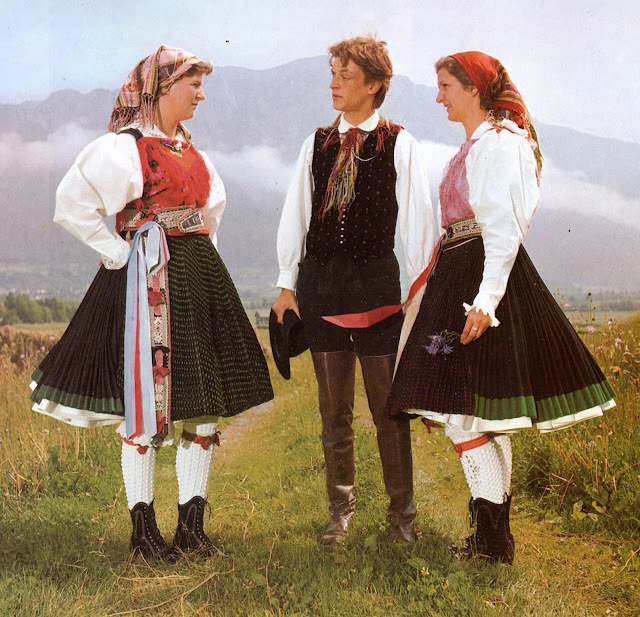 One question (possibly a stupid one) keeps bugging the lay seamstress in me: I cannot quite figure out how these countless skirt pleats are done! I understand that they are sewn and secured with the waistband at the _upper_ seam, but all the rest of the skirt? Are they done with a pleating machine; or ironed by hand and starched? In the pictures they always look so meticulous, it's amazing. 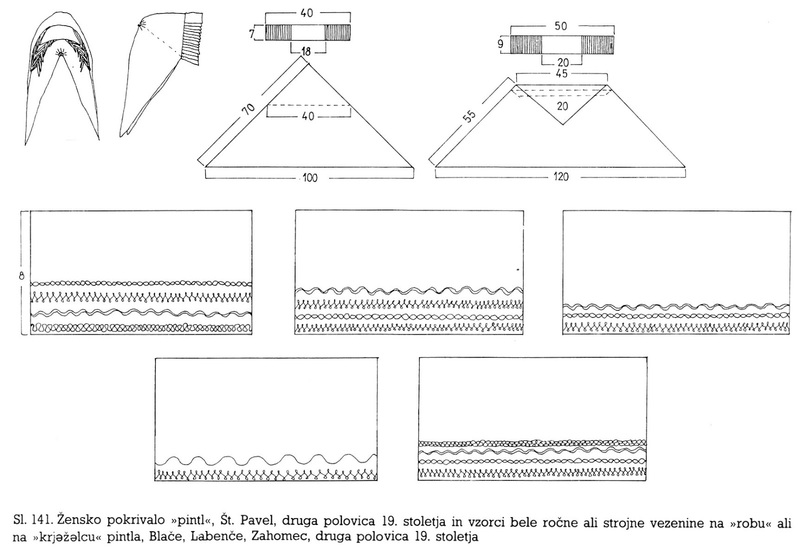 perhaps a pleating machine is used today, but in most places the pleats are folded by hand. 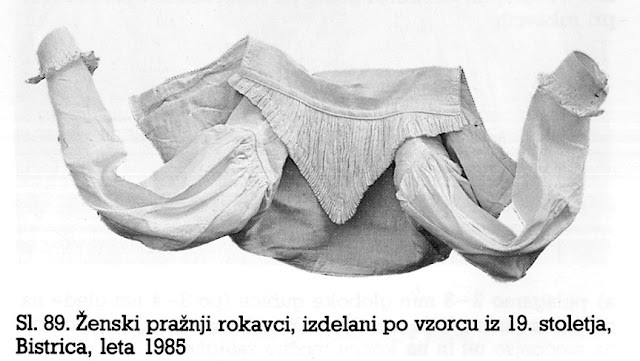 Often they are basted and tied together, then the whole skirt is wetted and let dry. In some places they use fresh bread to press them, if they are not too narrow. 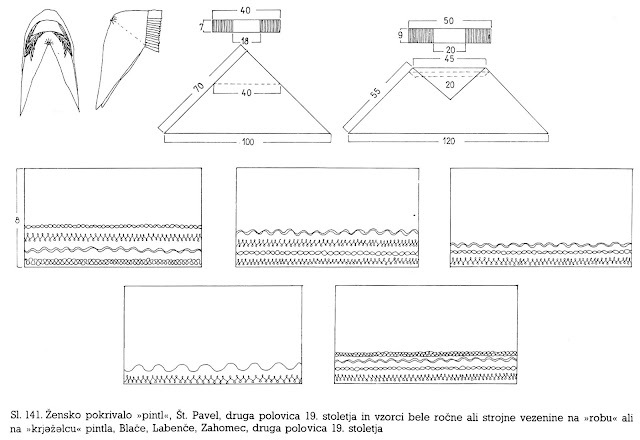 Some places use sugar water to set the pleats. One point of having pleats is that they move so wonderfully, another is that everyone knew how much work they were. Remember also that they were not washed. That is why you have undergarments of linen. Im sure there is more to it than I am aware of. Thank you for your explanations, they make me appreciate the dresses even more. I would like to know if the name "hanzəlč" from picture #14 has some further meaning in the language and how to translate it into English.